Recently, Nvidia has introduced a new set of drivers for their consumer level graphics cards that include select GeForce series and TITAN series graphics cards. These drivers are called Creator Ready Drivers, which are aimed towards content creators. 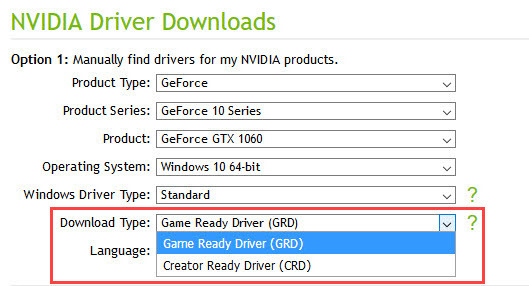 Now, when you try to download the drivers for your GeForce or TITAN graphics card then you will get an option to choose either Game Ready Driver (GRD) or Creator Ready Driver (CRD). It was not present previously because there was only one driver that you have to download for consumer level or gaming graphics cards, but now there is a choice. This has created a lot of confusion in the minds of some users that which driver they should download, and which is best for their needs and requirements. Also, they also want to know that what is major difference between these two drivers and which graphics cards do they support. So, to clear out this confusion, here I am going to tell you about these GRD and CRD drivers, and how they differ from each other. Here is a comparison between Game Ready Driver (GRD) and Creator Ready Driver (CRD) based on different factors. Game Ready Drivers are the regular gaming drivers for Nvidia gaming graphics cards that we have been downloading from past, until these new Creator Ready Drivers came out. These Game Ready Drivers or GRD are optimized for gaing and every new version of these drivers include the support for latest AAA or popular games. They may contain various bug fixes, performance tweaks and optimization for latest games (including Virtual Reality Games), and may include the support for any new feature that a new game has to offer. On the other hand, Creator Ready Drivers are designed to delivering optimum performance and stability in various creative applications that include Adobe Premiere Pro CC, Adobe After Effects CC, Autodesk Maya, 3DS Max, Autodesk Arnold, Unreal Engine 4.22, REDCINE-X PRO, Adobe Lightroom, Substance Designer by Adobe etc. These drivers are meant for content creators who are into video editing, online streaming, live streaming, 3D animation, photo editing, graphics designing etc. These drivers are claimed to be tested extensively by Nvidia for such workstation applications and tasks. Game Ready Drivers support variety of graphics cards or GPUs starting from GeForce 600 series, and going to as high as the RTX 20 series. 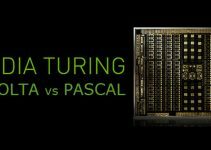 It supports graphics cards based on Kepler, Maxwell, Pascal, Volta and Turing GPU architectures. The support for older Fermi GPUs is strangely not included in the Game Ready Drivers. On the other hand, Creator Ready Drivers support graphics cards based on Pascal, Volta and Turing GPU architectures. However, it does not support GeForce GT 1030, which is an entry-level Pascal based graphics card. This card is really not meant for content creation, because it does not have that amount of power for heavy duty tasks, so its exclusion is quite understandable. This reflects that Game Ready Drivers supports wider range of graphics cards compared to Creator Ready Drivers. So, if you have an older Nvidia graphics card then you don’t have to worry about its driver support, because most probably, these drivers will cover it. However, I really don’t recommend using a newer graphics driver for a really old graphics card, because most of the time, it will not do any good, and in some cases, you may get lower performance and stability issues because of it. Below, you can complete list of graphics cards that are supported by Game Ready and Creator Ready Drivers. NVIDIA TITAN Series: NVIDIA TITAN RTX, NVIDIA TITAN V, NVIDIA TITAN Xp, NVIDIA TITAN X (Pascal), GeForce GTX TITAN X, GeForce GTX TITAN, GeForce GTX TITAN Black, GeForce GTX TITAN Z.
GeForce RTX 20 Series: GeForce RTX 2080 Ti, GeForce RTX 2080, GeForce RTX 2070, GeForce RTX 2060. GeForce 16 Series: GeForce GTX 1660 Ti, GeForce GTX 1660. GeForce 900 Series: GeForce GTX 980 Ti, GeForce GTX 980, GeForce GTX 970, GeForce GTX 960, GeForce GTX 950. GeForce 700 Series: GeForce GTX 780 Ti, GeForce GTX 780, GeForce GTX 770, GeForce GTX 760, GeForce GTX 760 Ti (OEM), GeForce GTX 750 Ti, GeForce GTX 750, GeForce GTX 745, GeForce GT 740, GeForce GT 730, GeForce GT 720, GeForce GT 710. GeForce 600 Series: GeForce GTX 690, GeForce GTX 680, GeForce GTX 670, GeForce GTX 660 Ti, GeForce GTX 660, GeForce GTX 650 Ti BOOST, GeForce GTX 650 Ti, GeForce GTX 650, GeForce GTX 645, GeForce GT 640, GeForce GT 635, GeForce GT 630. NVIDIA TITAN Series: NVIDIA TITAN RTX, NVIDIA TITAN V, NVIDIA TITAN Xp, NVIDIA TITAN X (Pascal). GeForce 10 Series: GeForce GTX 1080 Ti, GeForce GTX 1080, GeForce GTX 1070 Ti, GeForce GTX 1070, GeForce GTX 1060, GeForce GTX 1050 Ti, GeForce GTX 1050. 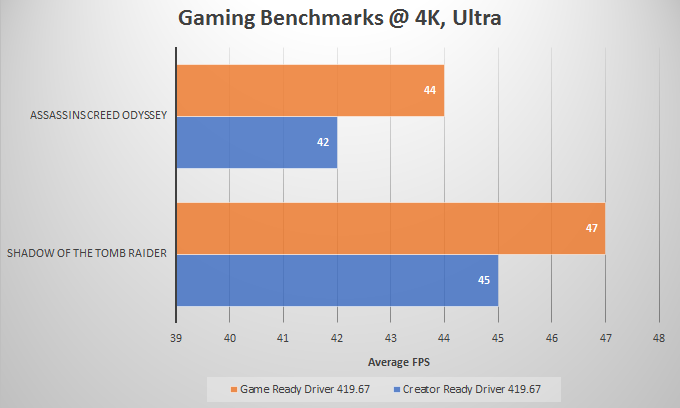 When it comes to gaming, then Game Ready Drivers perform slightly better than Creator Ready Drivers. In creative applications, there may or may not be a substantial difference between the two, but when it comes to stability and compatibility with newer softwares updates or releases, then Creator Ready Drivers will make a difference. According to Nvidia, Creator Ready Drivers has increased performance in popular creative applications vs. the previous driver branch. 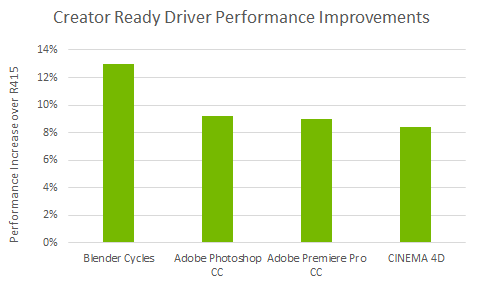 In the below graph, you can see performance gain for Creator Ready Driver version 419.67 over R415 drivers in Blender Cycles (up to 13%), Adobe Photoshop CC (up to 9%), Adobe Premiere Pro CC (up to 8%), CINEMA 4D (up to 8%). 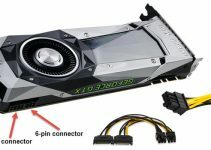 Both these drivers come with same features set, and you can switch between them from GeForce Experience. You will get the same interface and control panel for both GeForce Game Ready and Creator Ready drivers. Both these drivers can be used for gaming as well as for creative applications. However, they do perform better and offer higher stability for tasks they are designed for. This means Creator Ready Driver can be used for gaming as well, but you may not get the highest FPS using it, and Game Ready Driver can be used with Creative Applications, but you may not get that much stability or performance increase, when using it. So, it is better to use the right driver for the specific task it is optimized for. It is pretty obvious that Game Ready Drivers will have more frequent releases compared to Creator Ready Drivers, because new games are released more often as compared to software updates or releases. Game Ready Drivers are released in accordance with the game calendar and Creator Ready Drivers will be released in accordance with the creative app calendar. The first Creator Ready Driver release is version 419.67, which is optimized for various creative apps that include Blender, Adobe Premiere, Adobe Photoshop, Adobe After Effects, Autodesk Arnold, Unreal Engine 4.22, REDCINE-X PRO, Adobe Lightroom, and Substance Designer by Adobe. 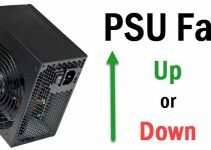 If you are primarily a gamer who want the best support for latest games, patches, DLCs and want to have the highest performance in games along with stability, then Game Ready Drivers are for you, but if you are a content creator whose work involves video editing, animation, photography, graphic design, and live-streaming, but occasionally enjoys a little bit of gaming too, then Creator Ready Driver must be your main choice. I think for mining, both of these drivers will perform the same, but may be Creator Ready Drivers can be slightly better for it. Also, when downloading drivers from Nvidia page, always select Standard drivers in “Windows Driver Type” drop-down list, because DCH drivers cannot be installed over a standard system and are mainly meant for OEMs implementing the Microsoft Universal Driver paradigm or Universal Windows Platform (UWP). DCH drivers are only available for Windows 10, and the term DCH stands for (Declarative, Componentized, Hardware Support Apps). Important Tip: Always use Display Driver Uninstaller (DDU) to remove previously installed driver for installing new driver for your Nvidia or AMD based graphics card. 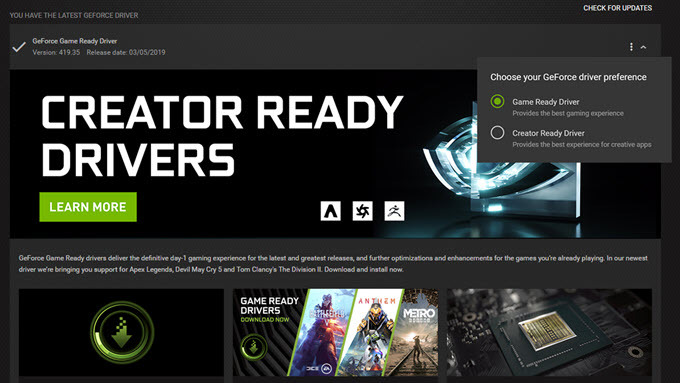 Creator Ready Driver (CRD) program is definitely a great move from Nvidia for content creators & professionals, who use consumer or gaming graphics cards for their work, and cannot afford an expensive Quadro workstation graphics card. I think the main reason why Nvidia has come up with two different sets of drivers is because it is difficult for one driver to deliver the best of both worlds. Also, these drivers are not strictly limited to one area of usage, because you can game pretty well on Creator Ready Drivers and can also use Game Ready Drivers for creative applications too, but you can face compatibility and stability issues with some of these professional creative softwares. However, you have been given a free choice to install any one you like, and you can switch between them any time, according to your requirements and liking. If you want to express your views on this topic or have some great insights regarding it, then tell us in the comment section below. Can we install grd on windows and crd on debian (dual boot) ? CRD drivers are available for windows only.